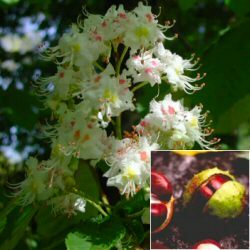 A classical tree of the British landscape, the Horse Chestnut tree (Aesculus hippocastanum) is one of our most familiar and well loved trees. The spectacular candle-shaped white flowers, tinged with beautiful yellows and pinks are one of its most lovely features, along with the shiny, burnished "conkers", loved by children everywhere. Compatible with most soils and environments, providing they are not too acidic or dry, this tree is a beautiful addition to any large garden or park. Expect a final height of up to 20m (65ft 7in). This tree is supplied at a height of 1.5 -2.00 metres in a 7-12 litre container for year round planting and better results than from bare-root stock.